On this episode Kris makes his grand return live from the faraway country of Japan. So, we of course discuss some Japanese games like Border Break and Project Diva f for the Vita. In addition, we bring up some recent news like the trailer for the Castle of Illusion remake, Sega Studios Australia shutting down and the cancellation of Aliens: Colonial Marines for WiiU. 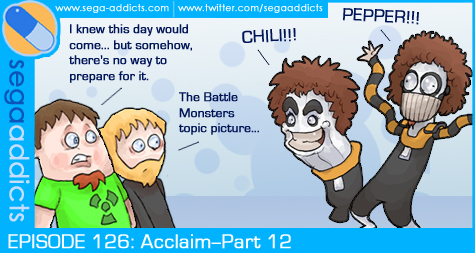 From there, it’s onto our 12th part of the Acclaim on Sega series as we dive into Virtual Open Tennis, Cutthroat Island, Bust-A-Move 2, Batman Forever: The Arcade Game and finally… Battle Monsters. The Sega Addicts Kids Table records tomorrow with Retro City Rampage creator, Brian Provinciano!